Fall and winter are a wonderful time for Brussels sprouts to feature prominently on family and holiday meal menus. Why? Because Brussels sprouts thrive in colder weather and it’s no wonder since its modern variety was cultivated a few hundred years ago in Belgium in Northern Europe. Contrary to its appearance, these sprouts are not actually baby cabbages, but just members of the same Brassica or cruciferous family. Unlike cabbages that grow out of the ground, the buds of the Brussels sprouts plant are harvested from long thick stalks. Brussels sprouts are nutrient dense little vegetables. They pack not only fiber, protein, vitamin C, vitamin K, but are also a store of antioxidant flavonoids and phytochemicals. In fact, one cup of boiled Brussels sprouts (156 grams in weight) provides you with nearly 4 grams of protein, 11 grams of carbohydrates, 4 grams of fiber, 56 milligrams of calcium, 1.9 milligrams of iron, 495 milligrams of potassium, as well as approximately 97 milligrams of vitamin C and 218 micrograms of vitamin K. Many don’t realize Brussels sprouts can be such a powerhouse of vitamin C. Just by eating one cup of cooked Brussels sprouts can provide enough vitamin C to meet the entire day’s Daily Recommended Allowance (RDA) for a healthy child, adult and pregnant woman (exceptions are lactating women and adults who smoke). When compared alongside a similar one cup serving size of boiled cabbage, Brussels sprouts contain twice as much protein, 7 times more iron and double the folate. This one cup serving size also provides you with more fiber, magnesium, phosphorus, potassium, zinc, vitamin E, vitamin C and vitamin K. However, one cup of boiled cabbage does provide slightly more calcium and is also a bit lower in carbohydrates. How do you cook Brussels sprouts? You can slice them thinly and add them to salads, put them into soups and casseroles, or cook them by roasting, steaming, stir-frying, boiling or sauteing. When roasting, Brussels sprouts can be dressed up simply with just some olive oil, salt and pepper, or you can add a combination of balsamic vinegar and other seasonings when cooking it. Whichever method you choose, just remember to wash, then trim and slice the sprouts in half first as this will quicken the cooking process. Also when steaming or boiling, do not over-steam the sprouts or you may be rewarded with a strong sulfurous smell. I usually make this a family affair, with my preschool and school aged children helping to ‘peel’ away the outer layer of each sprout before I wash and cut them– they actually love helping in the kitchen so this is a great task for them! The best holiday recipe I have come across so far for Brussels sprouts actually came from a grocery store magazine. It called for roasting Brussels sprouts tossed olive oil, salt and pepper in a single layer on a roasting pan for 20 minutes at 400 degrees F (200 degrees C). Then a sauce mixture is created consisting of dates, honey, Balsamic vinegar, green onions, thyme and lemon zest to mix into the Brussels sprouts. Finally, the dish is garnished with slightly toasted walnuts on top. So the next time you have trouble remembering how to call these delectable petite ‘cabbages’ (Brussels sprouts or Brussel sprouts? ), just think of Belgium and its capital, Brussels. 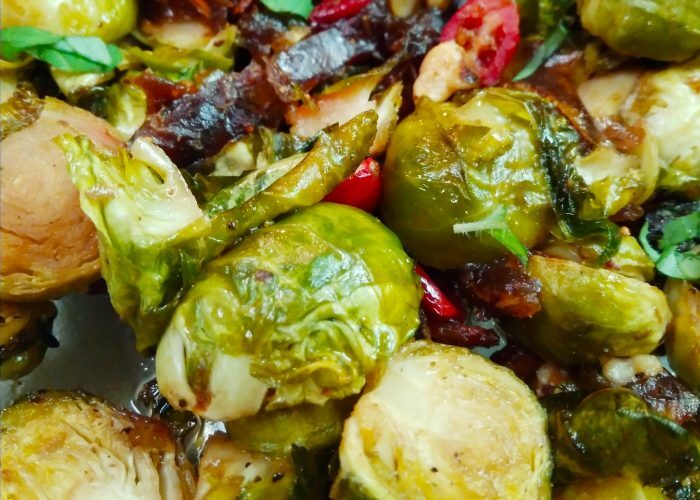 What is your favorite Brussels sprouts dish? Share in the comments below! USDA National Nutrient Database for Standard Reference. http://ndb.nal.usda.gov. Accessed December 13, 2018.